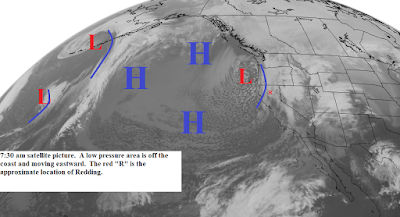 There is a cold low pressure area just off the coast and it will move across Northern California today. This system will bring periods of rain or showers to the area today with the showers tapering off late today and tonight. The showers will end by midday Tuesday. Snow levels will be 1000 to 1500 feet in the north and 2000 to 2500 feet to the south. Skies will be clearing Tuesday afternoon with sunny to partly sunny skies Wednesday through midday Friday. The airmass over the north state will be very cold and low lying sheltered areas will have cold temperatures tonight through Thursday night with some areas in the north valley in the upper 20s. Clouds will begin to increase late Friday as the next cold low pressure area approaches the coast. This system will be along the coast Saturday and move through Sunday and Monday. There are several complicating factors with the low. It is cold but if it stays close to the coast won't have a lot of moisture. The other is the cold air that will be trapped in the valleys of Northern California. This will cause very low snow levels. At this time it looks like periods of rain or showers Saturday and Sunday with a few showers Monday morning. Snow levels will be 500 to 1000 feet in the north and 2000 to 3000 feet south. At this time precipitation amounts look light.